Discussion in 'Android Accessories' started by spikejnz, Nov 24, 2009. I'm annoyed by the poorly designed and overpriced car dock for the Droid. I'm toying with the idea of designing and building (or rather, having a local company mass produce) a dock for the Droid. I'm working on getting a mockup of the Droid in SolidWorks, then I'll begin designing the dock itself. The way I envision it is to have the Droid slide in to the mount from the top. It would have the molded-in microUSB plug on the bottom and would have at least a 4' cable. Another thing I'd like to add is a cutout in the dock for the camera. Want to throw the Droid up in the window and record yourself hitting every apex perfectly as you hastily drive to work? Why not! ...The hardest part of this would be convincing the wife to let me dig into the savings to front the cash for an initial batch run. So I guess my point is: does this interest any of you? You can count me in, I have been waiting for something like this. Not sure if this will help you, but thought I'd pass it along. I just purchased the dock shown below, except that the one I purchased comes with double sided tape, a vent mount, and screws to attach to a separately sold mount from the same company. my point is, this is a very elegantly designed dock! You simply put the Droid (or gps or whatever) against the back of the dock (which is nicely padded), then squeeze the two side arms together, and they hold the Droid in place. The two side arms are composed of two pieces, which can be squeezed together, or moved apart to give a wider area holding the device when installed. They can also be raised or lowered independently of each other. The two side arms are also nicely padded. What's great about this design is, 1st, you can install the Droid with or without a form fitting case! Once I purchase my seidio inno case, which will add slightly to the overall size of the Droid, this dock will still work perfectly! Also, being the side arms move up and down, you can move each side out of the way of plugs and/or switches... I can lower the left side to expose the usb port when I want to charge the Droid in the dock, while raising the right side, so that it doesn't accidently hit the camera button! Not sure if you can contact the company that makes these, and perhaps purchase only the dock, not any of the mounts (cup holder, vent, cig lighter) and customize those with a plug? This company has done an excellent job! I guess it all depends on cost, but the idea is very cool. I have that mount. I purchased it for my Blackberry Tour. It works well for that, but not so good for the Droid. It's also cheap feeling, and worst of all, when installed, no access to the volume buttons, and when you squeeze it closed, it presses the volume to the off position. I want something designed for the Droid in mind, not some half baked mount that "Fits All", so I'm behind Spike. When you design/find a good dock...let me know...i need/want one particularly to have on the dash for navigation. I've found a local company that will do production of units after I come up with a design that works. A friend said i can spec his Droid doc for measurements. I just need to find my digital calipers. I'll also need to spec my Droid and draw something up. Like I said, the hardest part about this will be convincing my wife to let me do it. Hey, I'm sure it isn't for everyone, but people are obviously complaining even about the one designed specifically for the Droid (can't be used with a form fitting case, for example). That was really my point, that there are a lot of things that you need to consider. I had purchased, and immediately returned another mount. That one plugged in to the cig lighter, and provided another outlet to plug your charger into. Why they didn't simply provide a usb cable that goes directly into the Droid is beyond me. However, that one, just getting the Droid held to the mount was rediculous... I gave up. I wasn't going to risk damaging my device for a $30 mount! This mount, that I posted, was all of $20 from Target, and I have 90 days to return it! If the OP comes out with a cusomized mount that looks good, count me in! 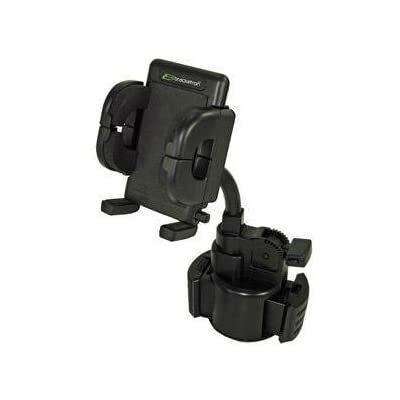 I have this mount on my desk right now for testing purposes as my company sells this holder and many others. You can move the jaws up/down and separate them to avoid buttons. I added a magnet inside to put the Droid into car mode automatically. My opinion is that it works but I prefer the one below as it is less bulky (just look at the holder, not the vehicle mount). The one and only advantage to the Bracketron unit is that it comes with a cupholder mount but this company also makes a cupholder adapter for window mounts too so there are more options.